To control the flow of Water, Air, Gas, Solvents, Vacuum and any other fluids not reactive with construction materials and free of sediment. Buna-N seating of the pilot and main orifices make the valves ideal for TIGHT SEATING, LOW PRESSURE and LOW FLOW conditions. 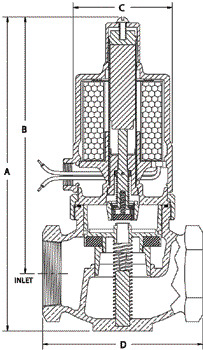 Valve operates from zero to maximum differential pressure indicated in table. 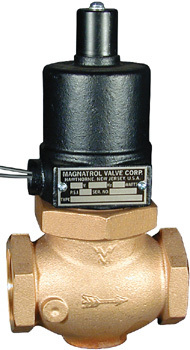 Valve must be mounted in horizontal pipe with solenoid enclosure vertical and on top.